During my sophomore year at Saint Louis University, my fellow culinary students and I attended an Advanced Meat Analysis class. Each day, we rolled up our jacket sleeves, grabbed hold of our boning knives, and peered apprehensively at the animals on our cutting boards. Our Chef taught us to break down chicken, duck, salmon, lobster, and beef shank; one memorable lesson culminated in the five of us taking to a half hog with hacksaws and machetes. We later came upon the head of the hog wrapped in a plastic garbage bag and tucked non-discretely in the fridge. Naturally, this resulted in gasps and quick-witted answers about our renewed appreciation for Lord of the Flies. I digress. In class, we got to work mixing spice blends and preparing cheesecloth to make bacon and pancetta; our Chef was particularly fond of cured meats and promised it would be worthwhile. And, though I was admittedly skeptical, I dutifully managed pig intestines as we prepared our sausages. One morning, our Chef casually mentioned we would use the products to make cassoulet. “All this work for one dish?” I scoffed to myself. The pot simmered on the stove for the day as our Chef added white beans, sliced a baguette, and told us to set the table. We gathered with spoons in hand as our Chef solemnly ladled the stew into each bowl. Needless to say, I was spellbound within the first bite and spent the hour-long meal in silent reverence. Each succulent spoonful brought back memories of curing, cleaning, stuffing, and stewing. The cassoulet meal marked a turning point; never before had I tasted a dish so rich, so complex, and so humbling; never again would I scoff at a dish so demanding of thorough dedication. We all remember food jags from our childhood- periods where we would eat one food meal after meal. Our concerned parents were calmed by the knowledge that food jags are normal for children and will pass with time. Alas, it seems I have reverted to this catch reserved most commonly for persons under the age of eight…I am hooked on kale. As I confess this mild obsession, it is with secret hope that I may turn others onto this particular vegetable. First, the culinary student in me loves kale for its versatility. Lately I’ve been wilting it into pastas, braising it with some pancetta and a touch of apple cider, or massaging it with lemon juice and olive oil then tossing it with dried cranberries. Second, the nutrition student in me loves kale for its nutrient content. In less than 20 calories, ½ cup cooked kale provides 100% RDA vitamin A, nearly 50% RDA vitamin C, and a hefty 650% RDA vitamin K. Bring on the paper cuts. Finally, the college student in me loves kale for its price and heartiness. An entire bunch costs less than a dollar, and can last in my crisper for weeks without the slightest droop. While in confession mode, I must also admit to bypassing kale and other assorted greens for most of my life, partly due to their unfamiliarity, but mostly due to my dread of awkwardly stuffing the entire leafy bunch into a tiny plastic sack in the middle of the produce aisle. It is now a feat I look forward to- stuffing two, sometimes three bunches into my bag. Given the inestimable virtues of this leafy green, it is one food jag I hope never tires. Drizzle olive oil over the kale and season with salt and pepper. Using your hands, massage the oil into the kale until it is coated. Arrange the leaves on a baking sheet in a single layer—don’t crowd them—they are very fickle and need their space! Bake in a 400 degree F oven for about 10 minutes, keeping an eye on them to make sure they don’t burn. Some pieces may cook quicker than others, so be prepared to remove the cooked chips and return the pan to the oven. The chips are done with they are dry and brittle…like a very delicate chip! Tucked away unsuspectingly in one of Saint Louis’s most historic neighborhoods is a school unlike any other. The school cafeteria is more than just a fueling stop; it is a classroom. Thanks to dedicated parents and the holistic educational approach of its administrators, Soulard School incorporates a Culinary Arts Program where a small team of students takes responsibility for the entire process of planning and preparing a meal for the school lunch. When they’re not sharing their made-from-scratch-with-love meals, the students participate in weekly nutrition classes. Though the program is now thriving, its beginnings were the picture of humility. When a parent raised questions about the quality of school lunches, Head of School Kelly Bock challenged her to take initiative and establish a new model for serving lunch. Mary Waskow, the tenacious parent, accepted the challenge in 2004 and set up shop with nothing but a crock pot and a wok; creativity and adventuresome palates were of the essence. One week prior to the meal, Mary sits down with her team of students to plan. Sometimes, she spreads out various cookbooks and allows the budding chefs to brainstorm their menu. Other times, she challenges them to make use of a featured ingredient such as leafy greens. The team then heads to the farmers’ market to meander the produce stalls, grocery lists and budgets in hand. Students practice their math and accounting skills, lessons which are usually taught in isolated classrooms. Any leftover funds are used to splurge on more expensive fruits such as berries. Back at school, students lug their hefty bags and store their treasures until it’s time to cook. In a blur of chopping, whisking, sautéing, measuring, basting, broiling, and baking, the cooking begins. Mary’s students abide by three rules. First, everything is made from scratch; processed and pre-packaged foods have no place in her kitchen. Second, all food groups must be represented. Third, Mary has the power to veto any suggestions; students have learned that including bacon in every meal will not make the cut. As the meal is being served, the team announces their menu to over 90 eager classmates. “Three bean soup, fruit salad, spinach salad, and crusty bread,” chorus the young chefs proudly. Discussion in the cafeteria ranges from what game to play at recess to the ingredients of the soup. When the chefs choose not to disclose the ingredients of a particular dish, their peers have been known to request a pencil and paper to brainstorm their best guesses. Though nutrition classes at Soulard School begin with the basics of hand-washing and food groups, by the eighth grade they are canning applesauce, dehydrating fruits and vegetables, and reading Michael Pollan’s The Ominvore’s Dilemma for Kids: The Secrets Behind What You Eat. One lesson challenged students to become entrepreneurs by choosing one of three projects: using the Missouri Harvest Calendar, either design a garden for the school, create a blueprint for a store selling local foods, or plan a three-course meal for a given month featuring seasonal fruits and vegetables. Business alliances were formed as students planning their gardens agreed to sell their products to the students running their local food stores; culinary minds were stretched as chefs worked to plan meals based on the Missouri growing seasons; teachers were delighted as the students worked spiritedly and noiselessly on their projects. Soulard School not only serves wholesome lunches, but also engages students in the entire process, from planning and shopping to cooking and serving. The Culinary Arts Program prepares students to be food-lovers, confident in their own kitchens, and advocates for food that is both wholesome and delicious. Last November, I and my fellow Saint Louis University Dietetic Interns trekked to Boston for the annual Food and Nutrition Conference Exposition. The conference offered dozens of lectures to choose from and I easily gravitated towards those pertaining to my central interests: child nutrition and school lunch. Expecting to be inspired and full of new insights, I left the conference with one conviction: my values and nutrition philosophy do not align with the mainstream efforts to reverse the nationwide trend of childhood obesity and poor food quality in schools. As hopeful as we may be, offering fat-free milk instead of whole milk will barely make a dent. As I teeter atop my soap box, I cannot claim to have the answer to this question, though it does keep me awake at night. I do, however, know where my place in this battle stands. At this point in my career, it is not with the mainstream efforts or elite policy makers. Rather, it is working one-on-one with the students on a daily basis, instilling sound nutritional values, and building a healthy community around a local school. I have a dream that the traditional role for a dietitian will shift from the tertiary care setting of a hospital to the primary care setting of a school. Imagine if every school had its own dietitian to watch over the health of its students. The RD could provide health/nutrition education, oversee the foodservice, hold stake in the PE curriculum, head up a wellness committee, coordinate a backpack program…the options are plentiful! My personal goal is to dedicate myself not to just a school district, but to one school specifically. Rather than spread myself thin and have little influence in many places, I aim to give myself fully to one school. I want to know every student’s name. I want to see their faces every day, to ask how their night was, and to head to the kitchen to make sure they get a healthy meal in their bellies. As of now, these positions are rare and far between. School districts are lucky to have a committed dietitian, let alone one at a single school. For this reason, as is the case with more and more RDs, I am putting on my entrepreneurial hat to forge my own path. In my experiences both during undergrad and the internship, I have seen not just how critical the need is for dietitians in the school system, but also how alert communities are becoming to the issues of child nutrition and obesity. Teachers, administrators, and parents are all perking up, and Lady Obama is certainly doing her part to raise awareness. This is my shameless plug for dietitians to eschew the clinical roles and head for schools. Imagine if we were so committed to instilling sound healthy habits in children that they couldn’t help but grow up and love exercising and fruits and vegetables! Imagine how fewer diet-related diseases we would have. 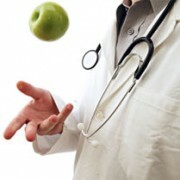 Imagine how the pendulum could switch from dietitians in hospitals to dietitians in schools. We need you! The Mills Brothers knew what was up—getting a job! Throughout the internship, a handful of my dietetics friends knew exactly what they wanted to do as an RD; others still have no idea. The awesome part of our field is that it is so diverse. Dietitians can work in the traditional roles (clinical, foodservice management, etc. ), or they can find jobs in the ever-growing grassroots sectors (culinary arts, school nutrition, entrepreneurship). Many dietitians start in one job and switch to another after a few years. Many dietitians work part-time. 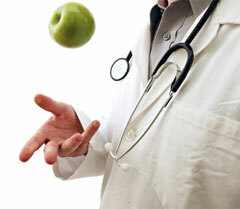 Many dietitians hold multiple part-time jobs. Many dietitians work full-time and do their own thing on the side (i.e. a small counseling practice). We are lucky to be in such a diverse and growing field! My first job as an RD was the summer right after the internship. Food Outreach—a nonprofit that serves clients with HIV/AIDS and cancer—was actually one of my sites during the internship, as well as the site for staff relief. This was one of those untraditional roles I am so fond of, as I got to work alongside their executive chef. Though they have two dietitians on staff, my role was in the kitchen. Some days we cooked on a smaller scale (i.e. specialty lunches for clients), and some days we cooked in mass quantity (i.e. 4,000 meals to keep the freezer well stocked)! Whatever your first job may be, my experience was certainly a tribute to the connections you can make during your internship. Count this as one of the gems of the whole experience: you get to meet and work alongside so many different professionals throughout the year! My mentor encouraged me to write thank you cards to each of my preceptors; given that we changed sites every two weeks, my investment in stationary and ink was significant, but definitely worthwhile. Although I am now on the “other side” of the much discussed RD exam, I was in your same seat just a few months ago, busily studying my flashcards and taking practice tests. In hindsight, the exam was rather anticlimactic. Registration was a breeze—just waited for the Commission on Dietetic Registration (CDR) to get all my paperwork in order after the internship, sent in my $200 check, and called the toll-free number to schedule the exam at my convenience. The exam is offered year round at over 225 test centers across the country, so I was able to find one close to my dear city of St. Louis. After completing the internship at Saint Louis University in May 2011, I allowed myself about six weeks to study before my exam date. MedPreps was a huge help—especially the practice tests—and I actually felt over-prepared for the exam. In terms of how much time to allow for studying, I had friends all over the board; some crammed all their studying into the month after the internship and took the test ASAP (it takes about a month for the CDR to process the paperwork), some studied at a slower pace and took the test a few months later, and some gave their brains a nice long break and got back into study mode several months later. Either way, you have one year to take the exam after your paperwork goes through! In terms of the length, there is not a set number of questions. Though each examinee will receive 125 questions (100 of which are scored, 25 of which the CDR is testing out for future use), you may receive up to 145 questions. Imagine a pendulum going back and forth until it settles on one spot; that is similar to how the computer is determining your score. A simple word to the wise: prepare yourself for 145 questions so that you will be in the right mindset to do your best until the end. In other words, don’t count of 125 questions and get burned out too soon! I mean this to comfort my fellow dietetic students: the test was straightforward. There were no especially tricky questions, no super lengthy calculations, and no mind bogglers. Though you are allowed three hours to take the test (which includes the introductory tutorial), my fellow test takers and I took about an hour and a half. The more time you put into reviewing your notes and taking practice tests, the breezier the actual exam will be. One additional note on the exam: the outline is changing as of January 1st, 2012. The old exam used to include five topics: (1) Food and Nutrition Sciences, (2) Nutrition Care Process and Model—Complex Conditions, (3) Counseling, Communication, Education, and Research, (IV) Foodservice Systems, and (V) Management. The new exam has four topics, which are listed below. Make note of what percent of the exam each topic accounts for. For example, Nutrition Care for Individuals and Groups accounts for 50% of the exam, whereas Principles of Dietetics accounts for just 12% of the exam. Both need your attention, but give time where time is due! Just make sure you adequately prepare with practice tests and you’ll be fine! Remember that your grade on the exam doesn’t matter; you either pass or you don’t. Hopefully you will likewise find yourself over-prepared once you are on the other side, too.